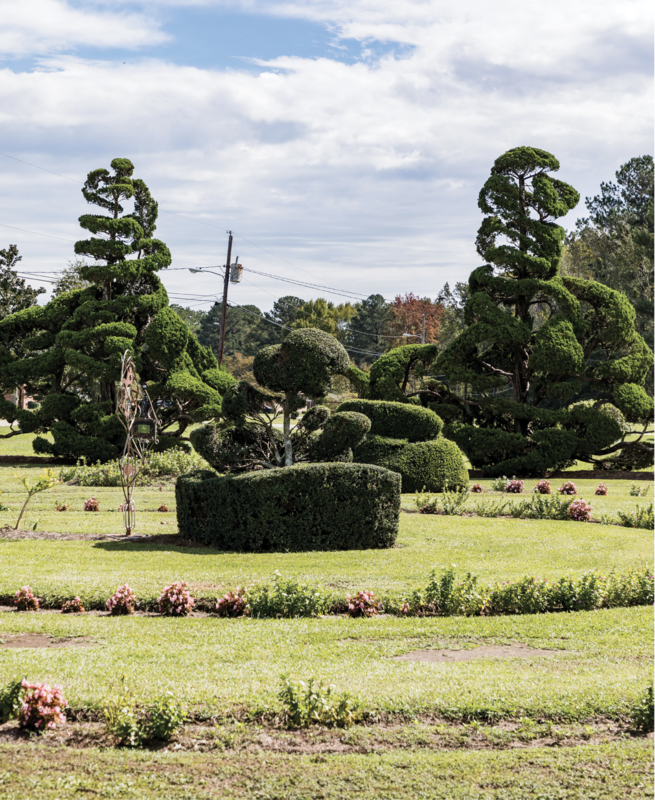 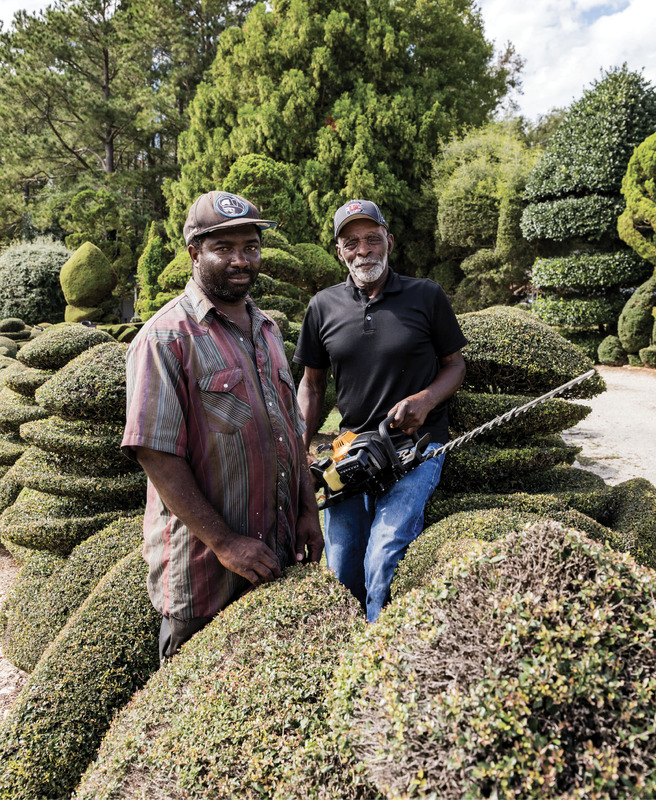 About 130 miles from Charleston, signs for the Pearl Fryar Topiary Garden point the way to a residential street in Bishopville (population 3,238). 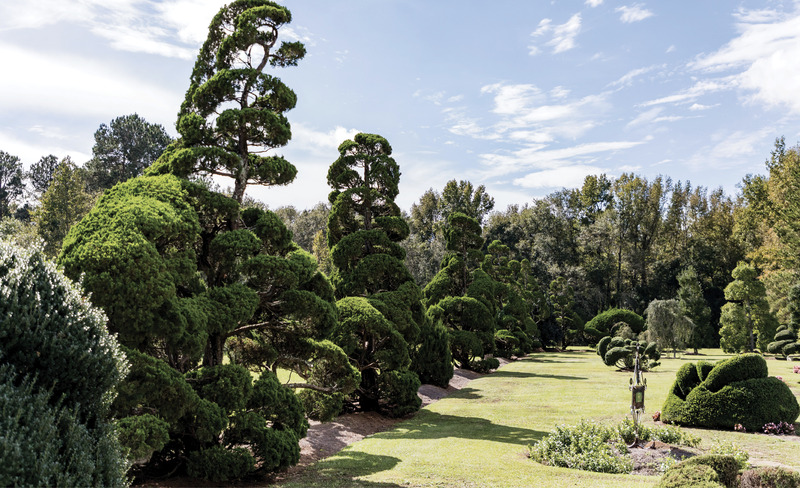 Visitors to this strange landscape might think of Seussian “truffula” trees, but these are living sculptures—thousands of dwarf yaupon hollies, Hollywood junipers, Leyland cypresses, and pines twisting and bending, arcing and soaring into a verdant wonderland of imagination. 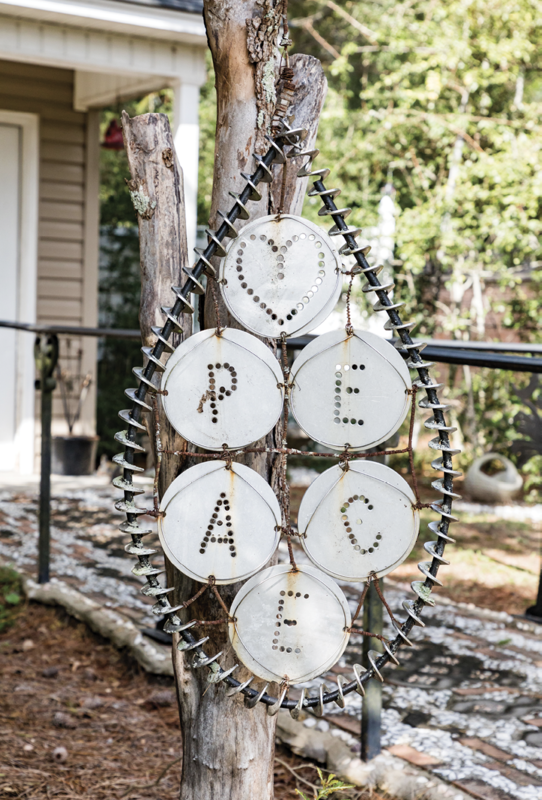 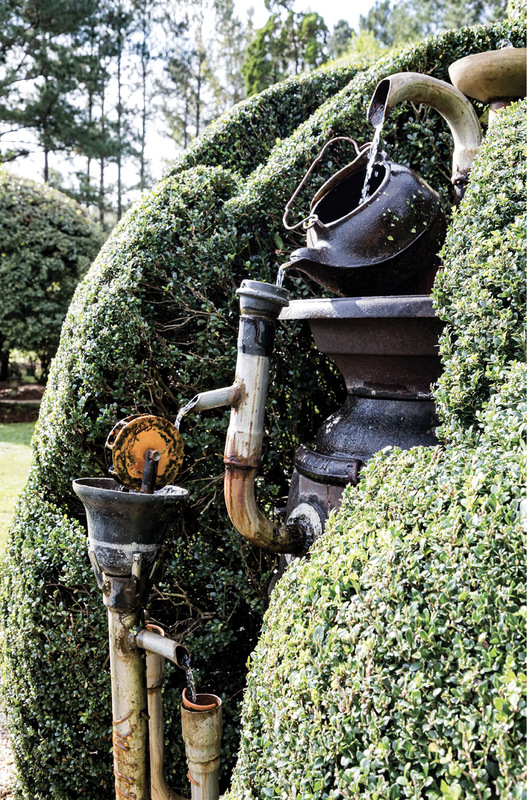 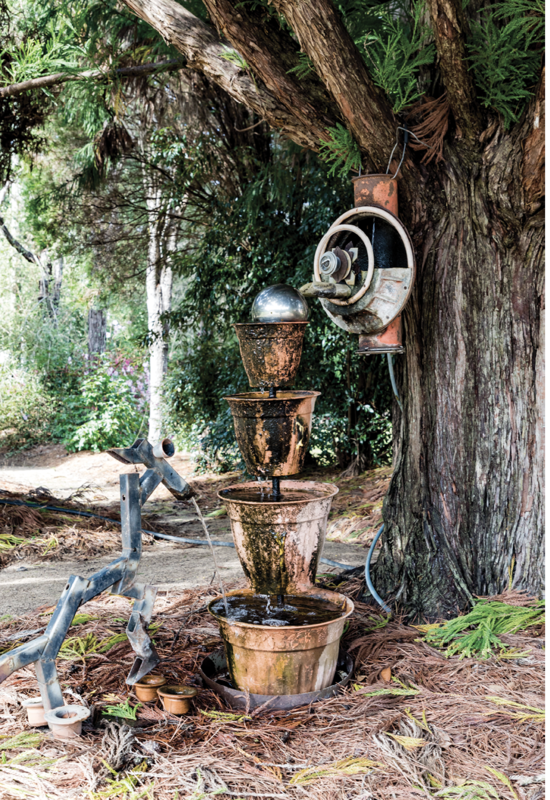 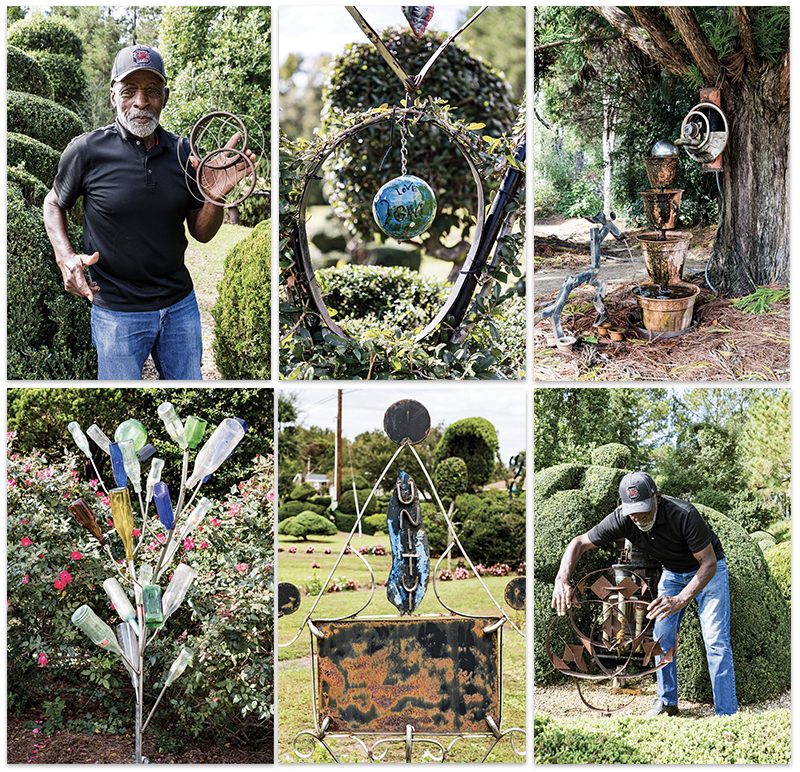 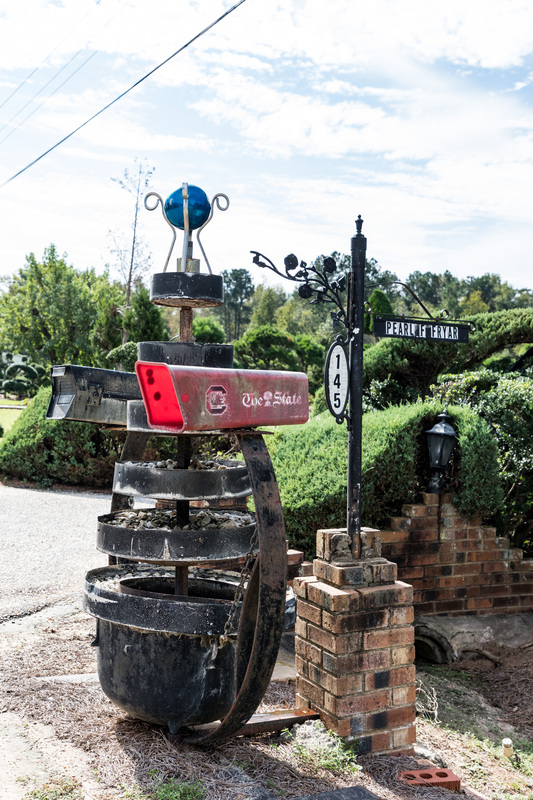 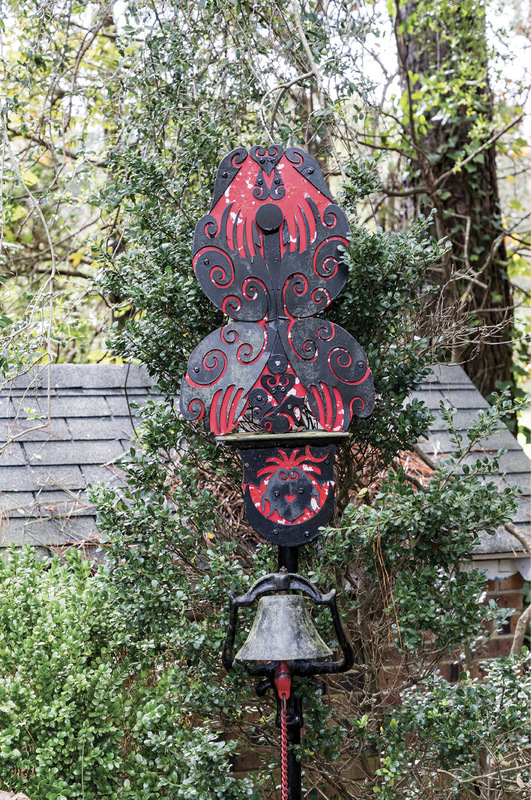 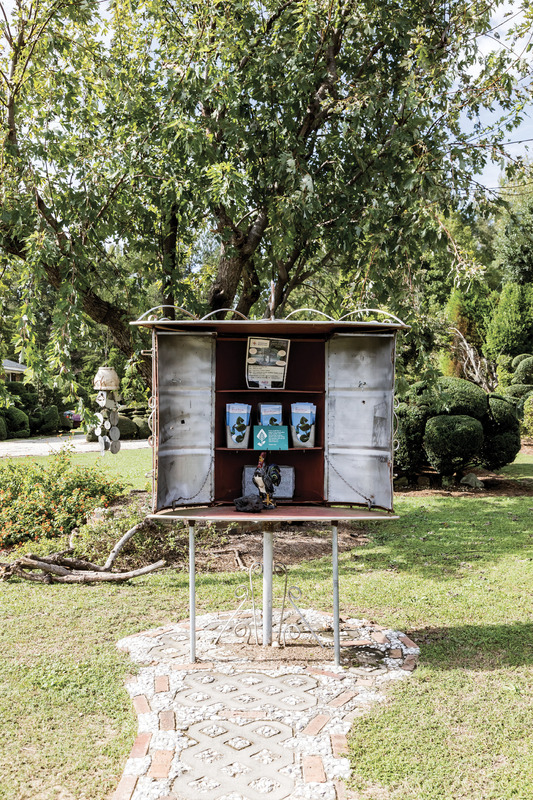 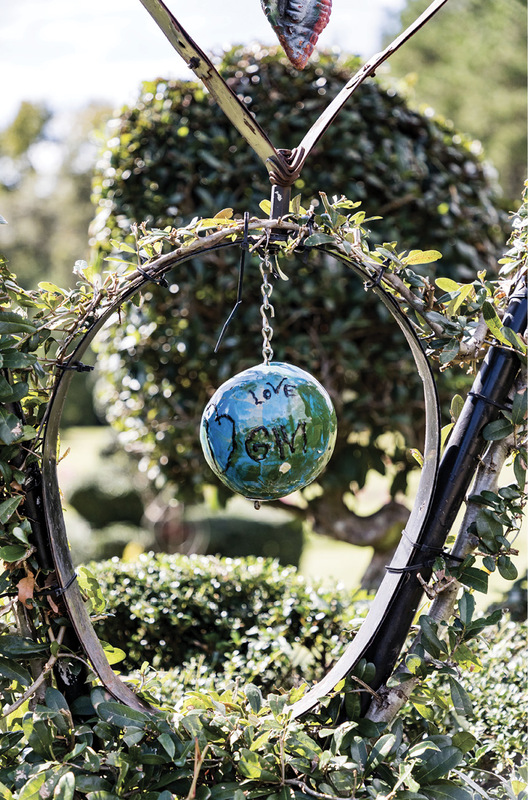 Words of Wisdom: Over the years, Fryar has added more fabricated sculptures as counterparts to shrubs and trees. 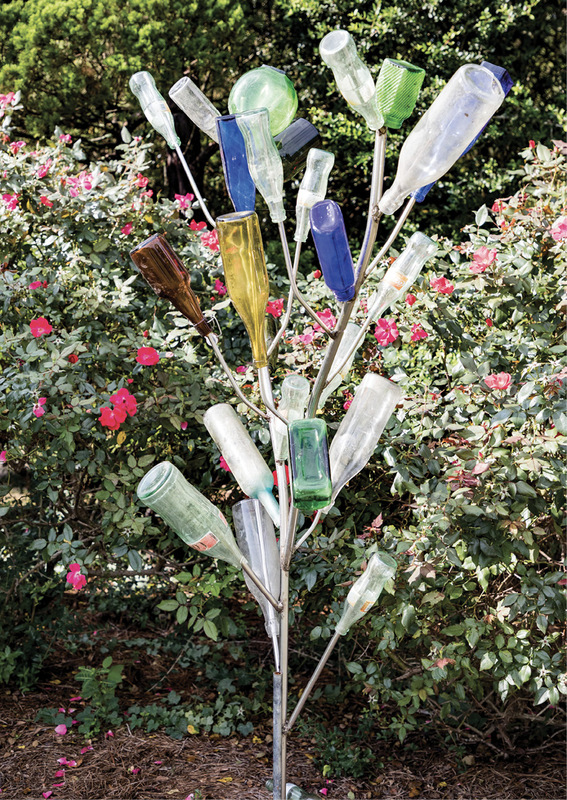 He uses metal pieces, pottery, bottles, and other found objects. 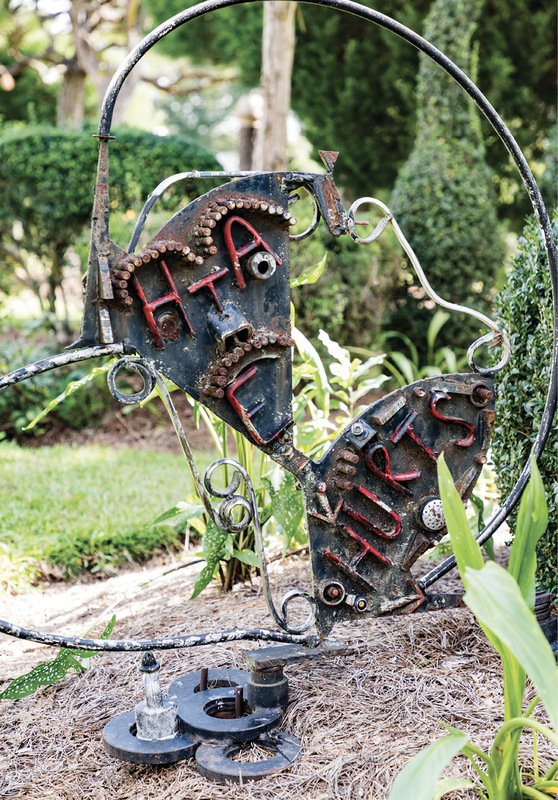 Sometimes he adds lettering, such as for the metal sign with “Hate hurts” and an arrow pointing downward (bottom left). 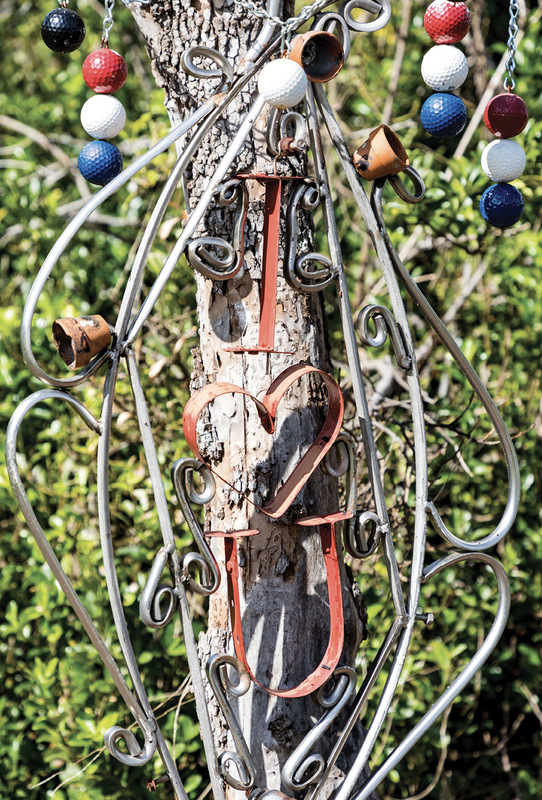 The other side reads “Love and Unity,” with an arrow pointing upward. 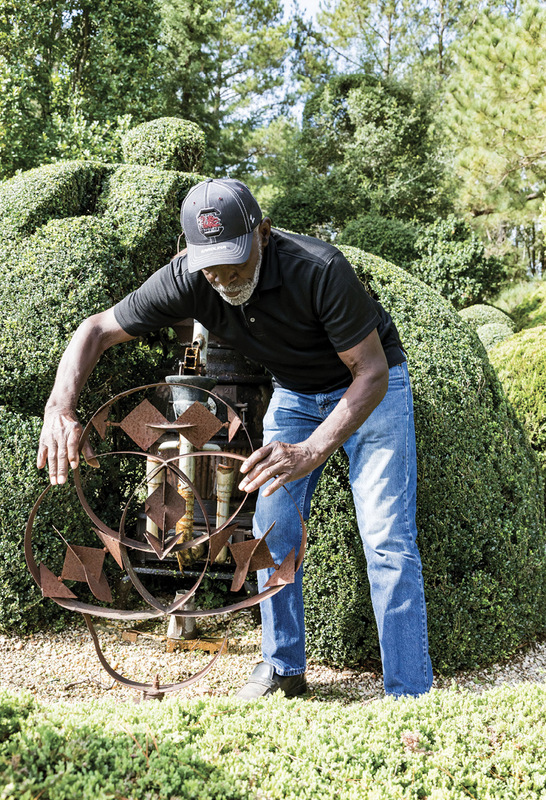 He designs the sculptures to be portable so he can store them during hurricanes, and portions are often interchangeable. 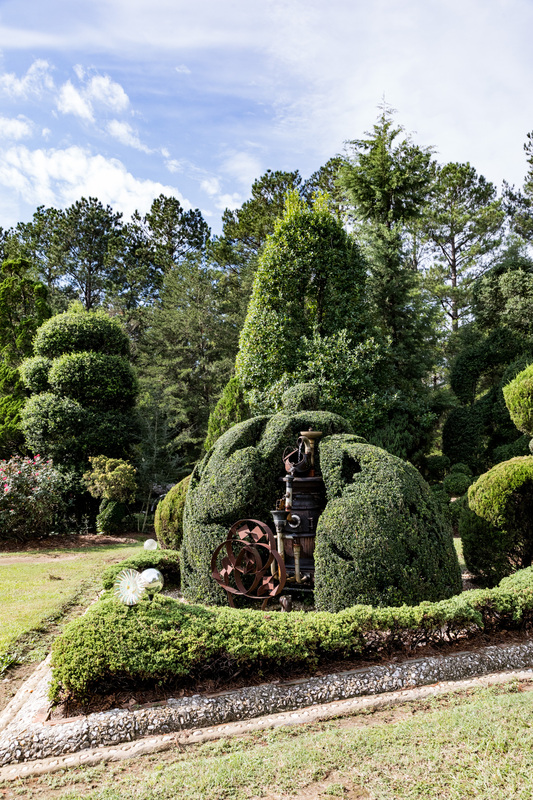 Fryar worked as an engineer for a soda can manufacturer first in New York and then in South Carolina. 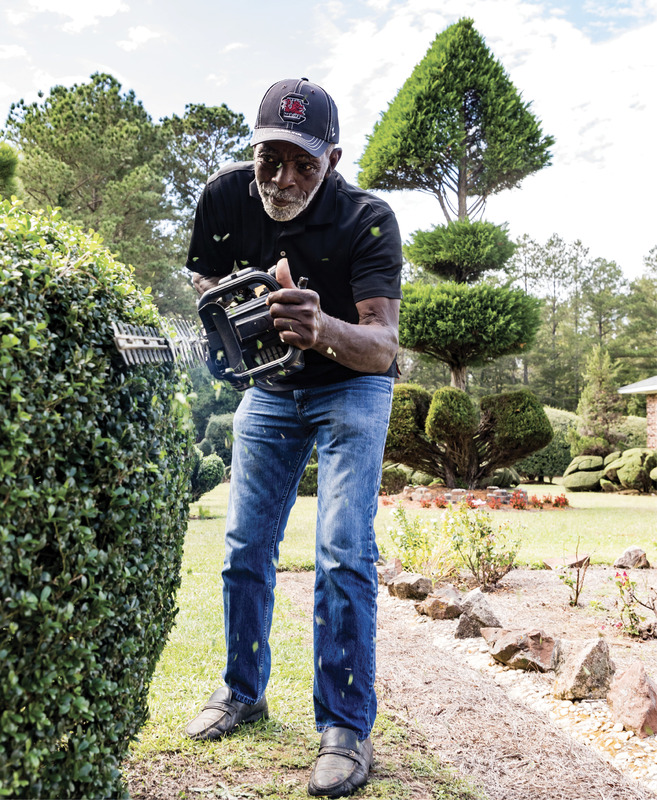 He and his wife, Metra, moved to Bishopville in the late 1970s, and his yard improvements began when he built a curved driveway of brick, stone, and hand-mixed concrete. 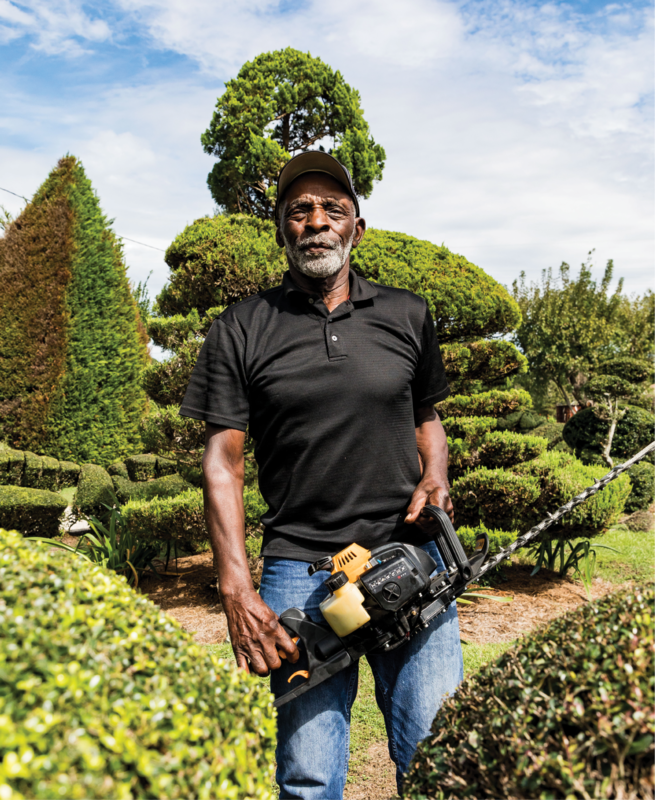 He then started experimenting with a hedge trimmer on salvaged, “throwaway” plants given to him by friends and local nurseries. 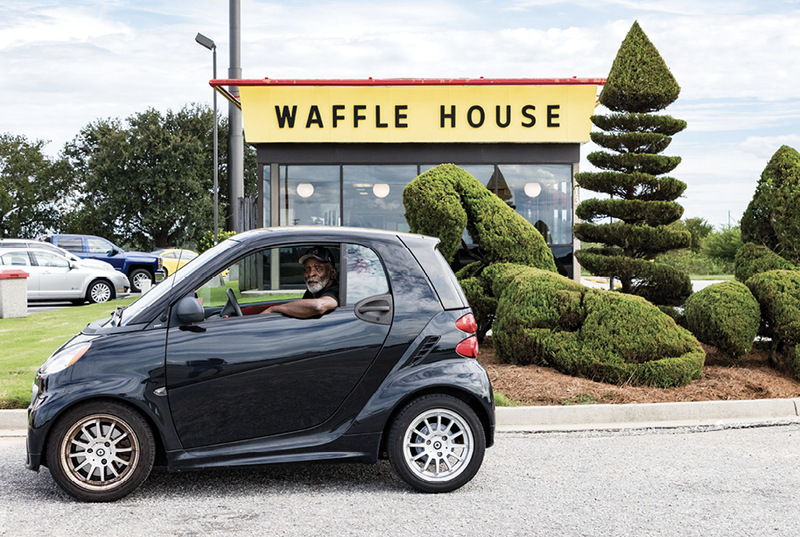 By 1985, he’d earned Yard of the Month. 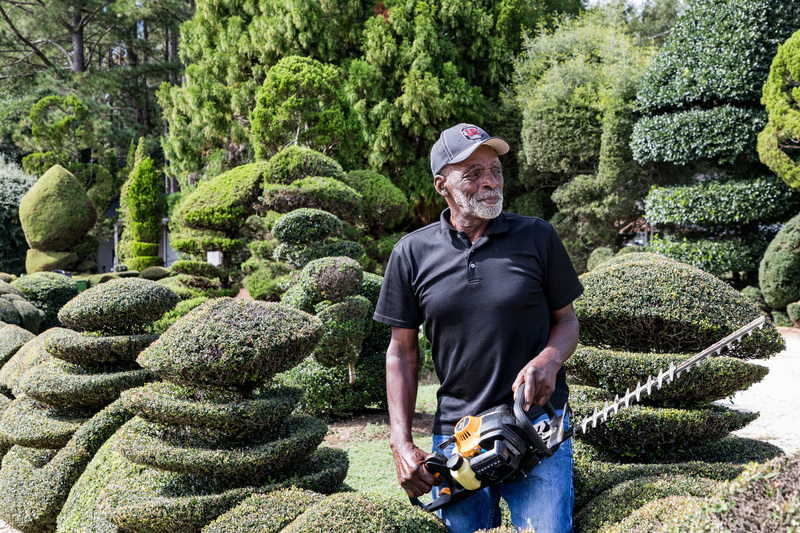 Over the years, Fryar and his garden have become famous. 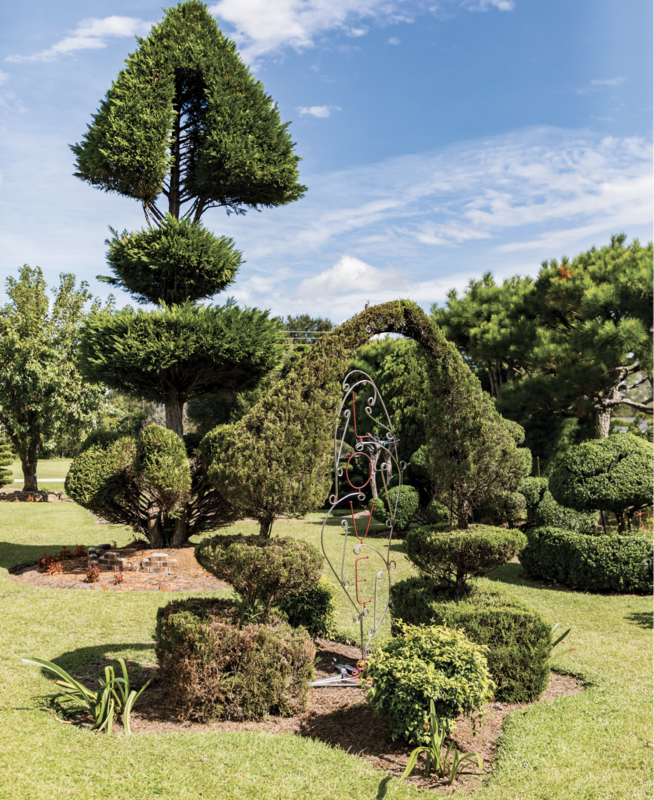 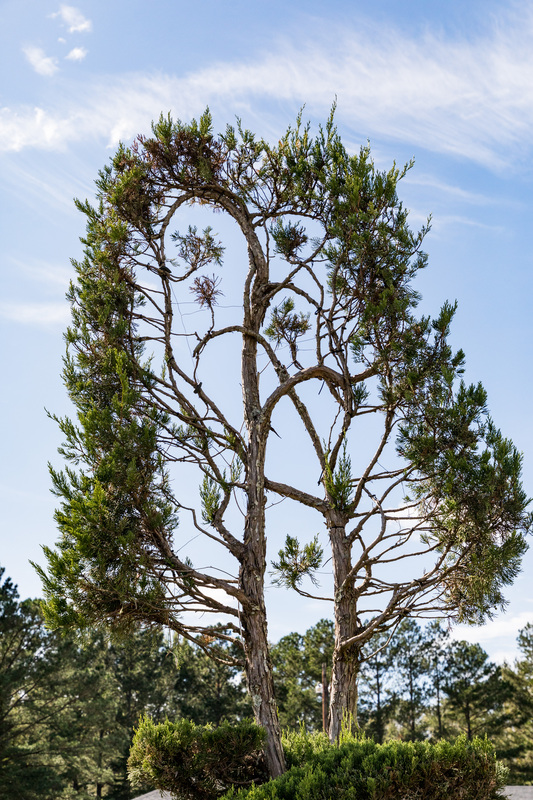 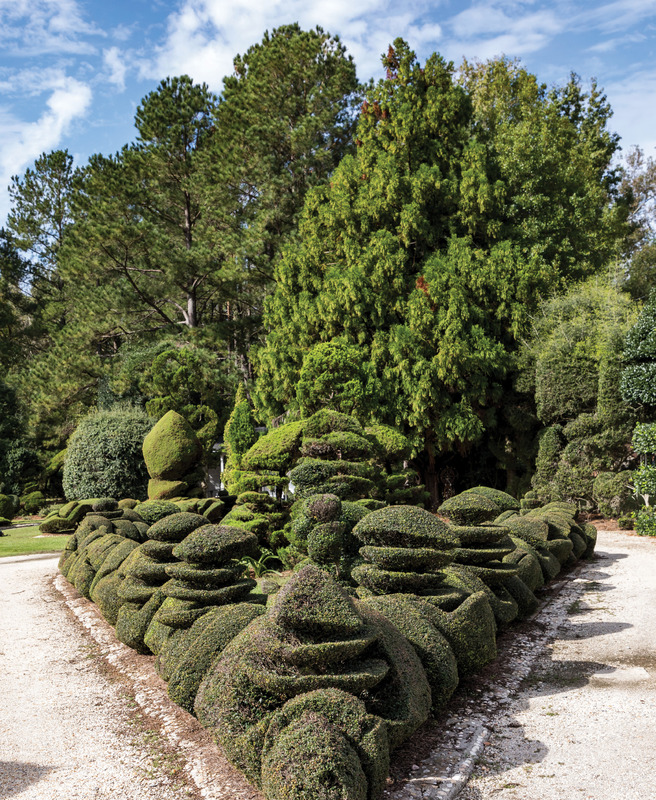 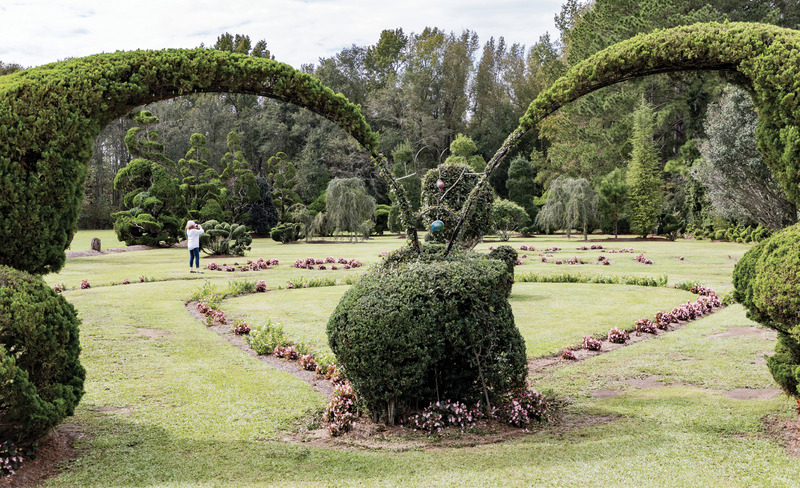 In the 1990s, the South Carolina State Museum in Columbia commissioned him; a juniper deemed “Heart within a Heart,” grows on the grounds to this day. 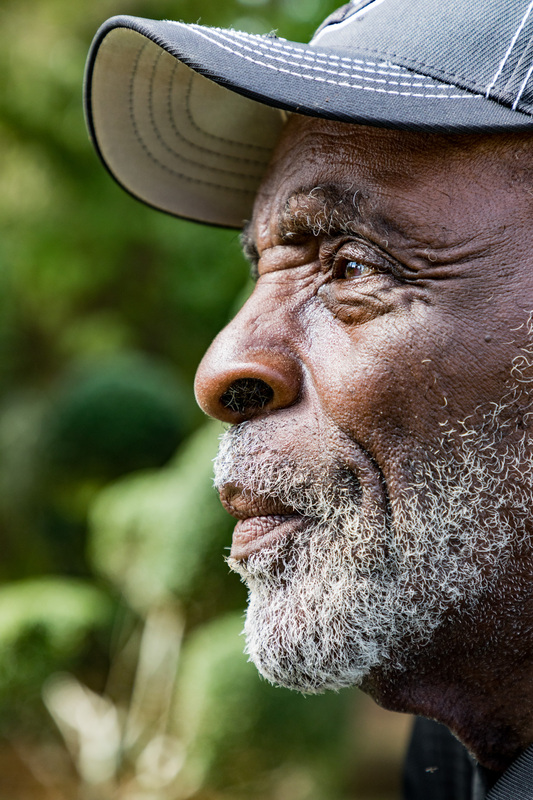 A decade later, film directors Scott Galloway and Brent Pierson created the documentary, A Man Named Pearl. 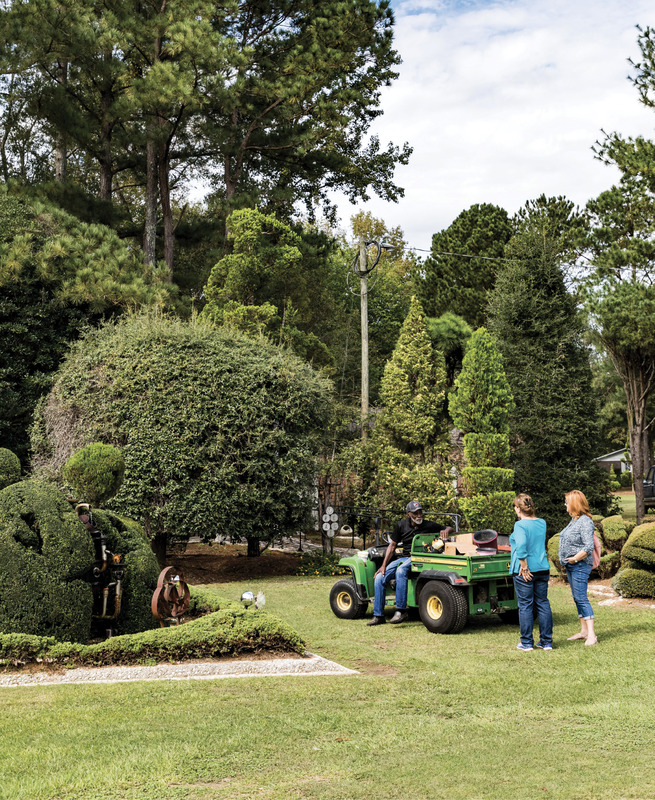 Crews from CBS Sunday Morning to National Geographic, and many more, followed suit. 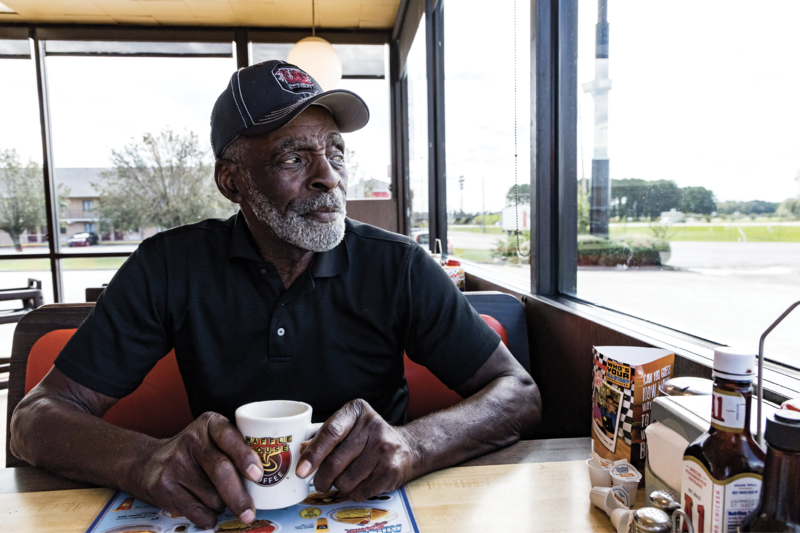 With Love & Purpose: “Life is about love,” says Fryar, who has been married to his wife, Metra, for 52 years. 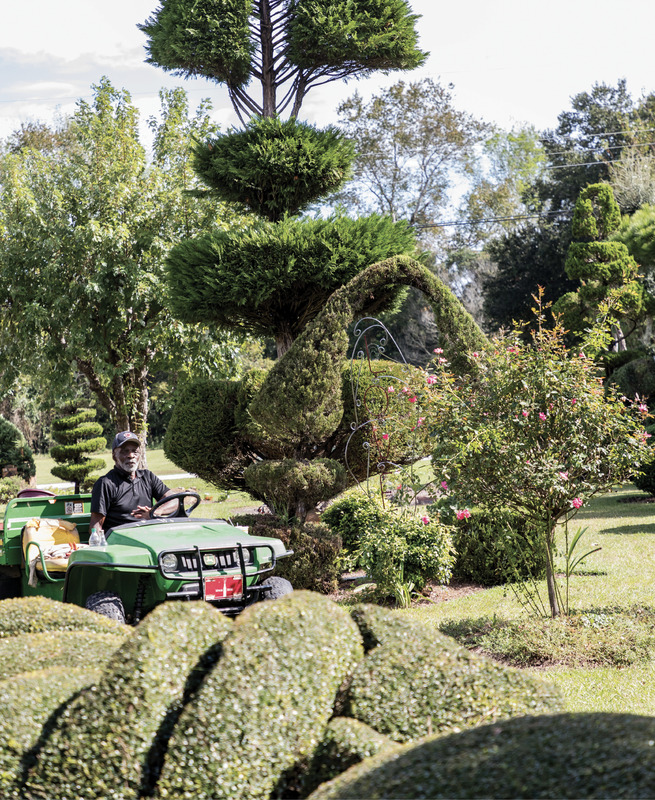 He is proud to have created something that people haven’t seen before. 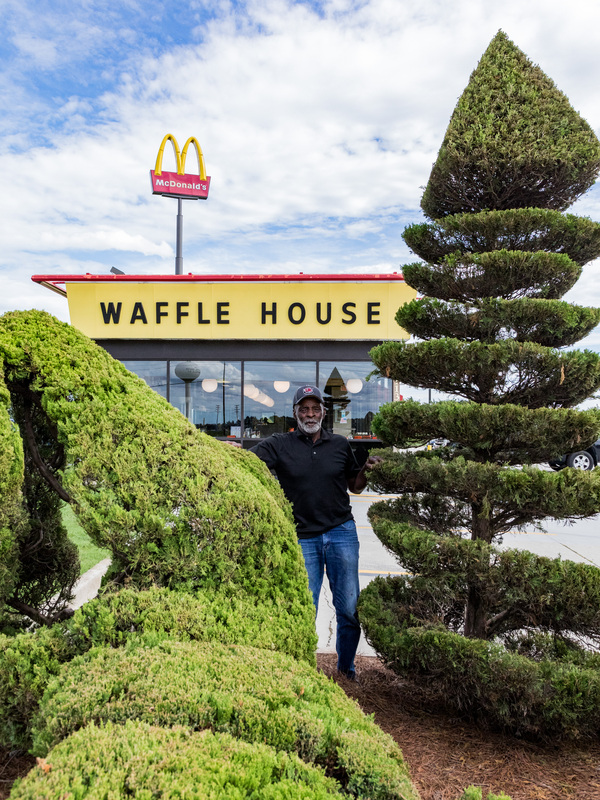 “I want people to find more here than they expected,” he says. 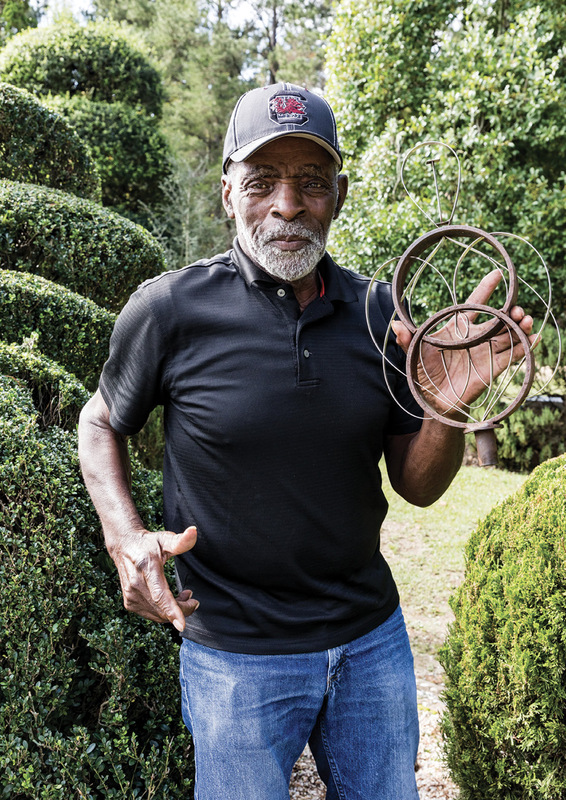 Fryar is a man of daily rhythms. 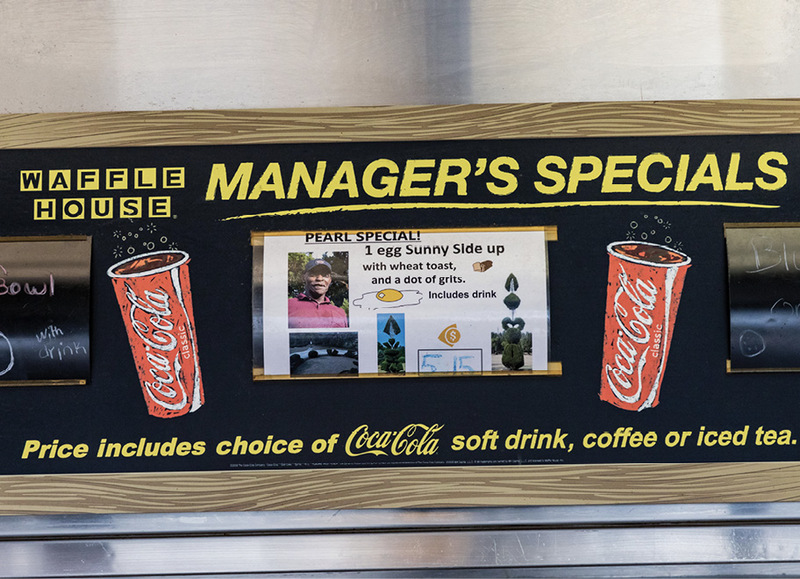 Most mornings he goes for breakfast at the nearby Waffle House, and he’s so consistent with his egg, toast, and “dot of grits” order that the manager named the “Pearl Special” after him. 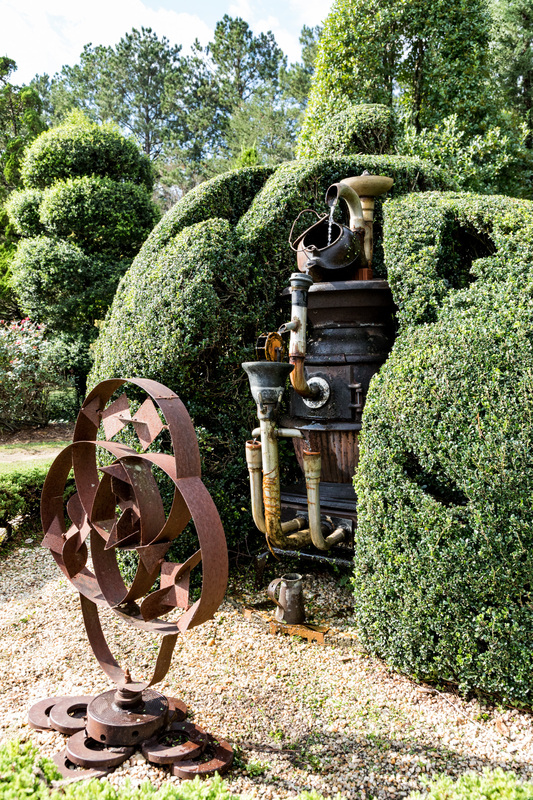 Then he minds the garden through the early afternoon, often talking with visitors and joining them for a photograph. 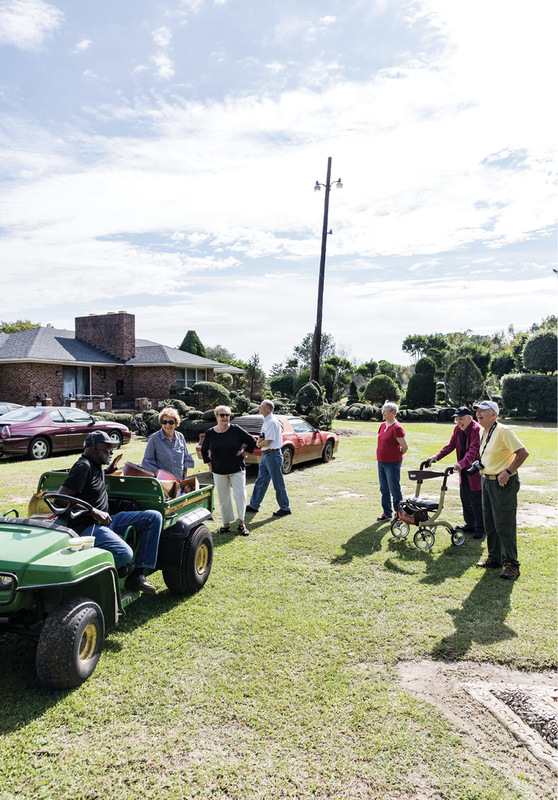 SCHOLARSHIP: A proponent of education, Fryar has awarded scholarships to local students to attend community colleges and technical schools. 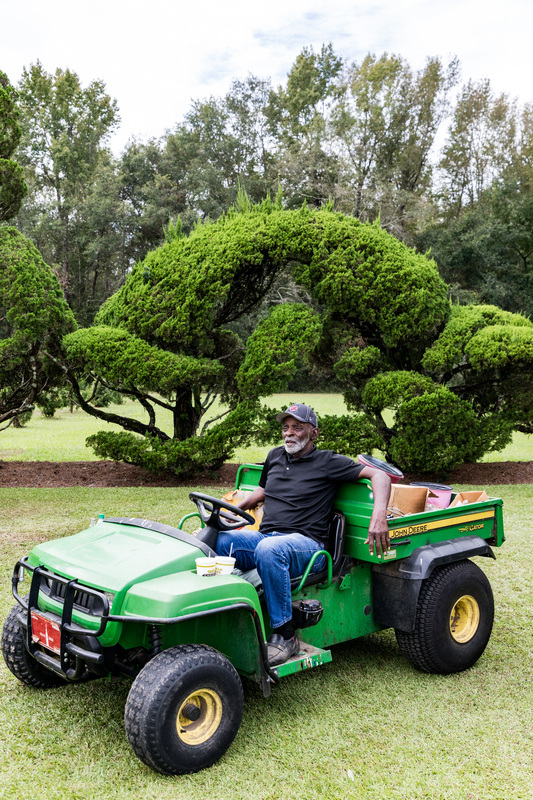 VISIT: Fryar’s evergreen garden is located at his home, 145 Broad Acres Rd., Bishopville; pearlfryar.com. 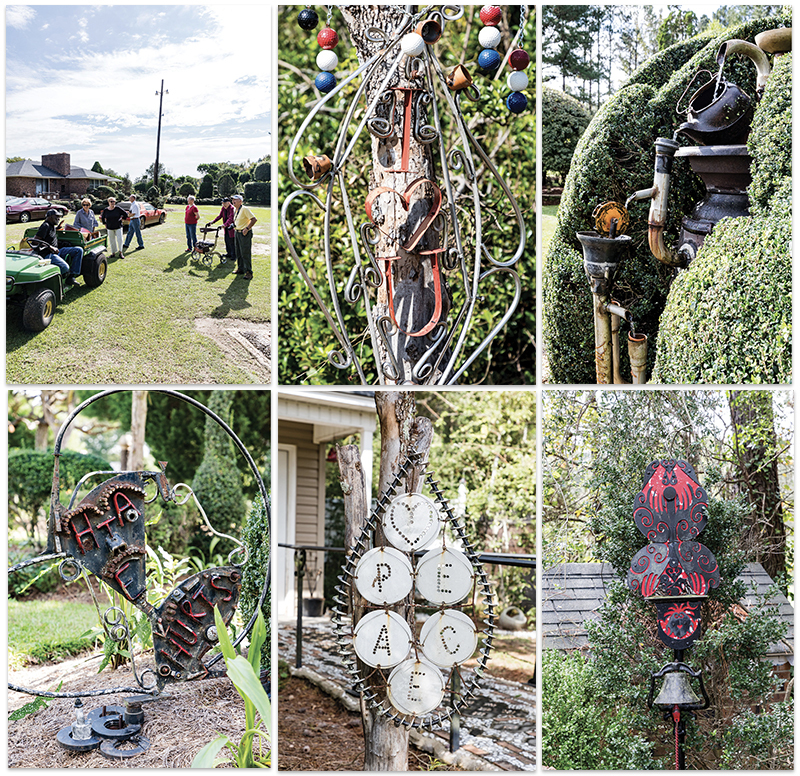 Visitors are welcome Tuesday through Saturday from 10 a.m. to 4 p.m. 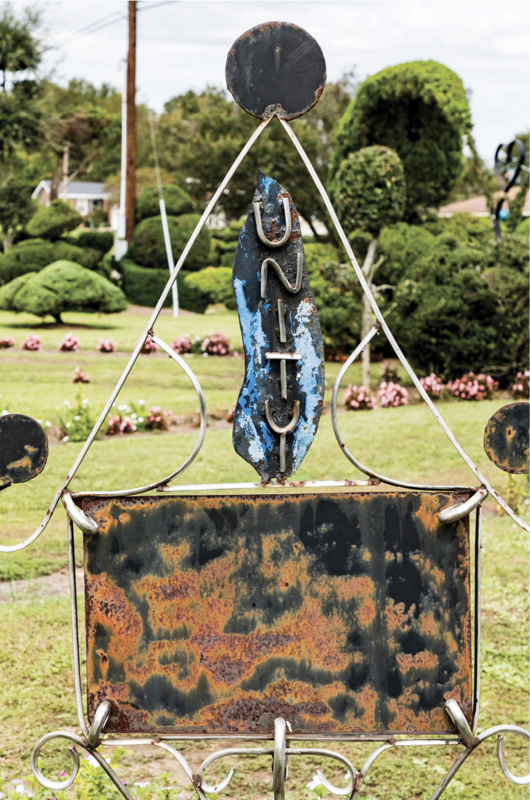 Admission is free, but donations are encouraged.